The CoffeeShop Blog: CoffeeShop "Spring Facebook Cover Set"
CoffeeShop "Spring Facebook Cover Set"
I have another Easter/Spring freebie today! This one is a pretty Facebook cover set for Photoshop/PSE. It is a layered psd file so you can add your images using clipping masks (tutorial and free action). I included 2 pretty digital paper backgrounds (Spring Flowers, Shabby Chic Bunny) and also a simple color background layer, but feel free to add any texture or digital paper you want to the background. You can change the ribbon and border colors and add your own text/logo. Have fun playing with this one!!! 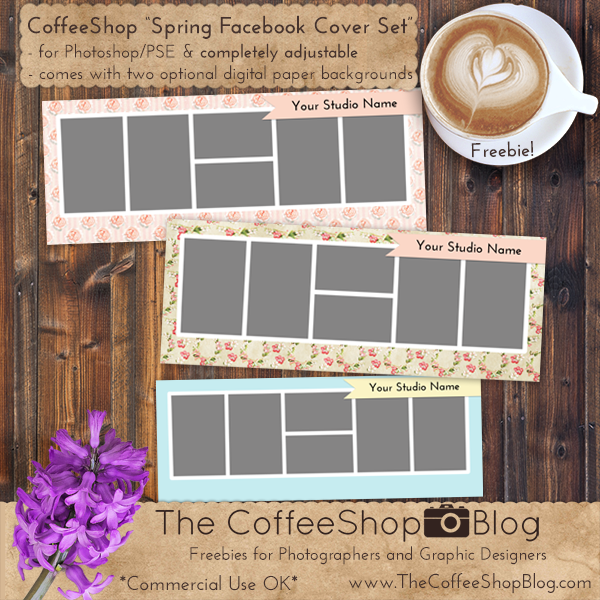 Download the CoffeeShop "Spring Facebook Cover Set". Your creations are so wonderful and I appreciate your generosity SO much,that I just bought your mega pack and I can't wait to get into it! Everybody needs some appreciation from time to time and you certainly deserve it, so here you go!